Did the media attention from the movie help the real Patch Adams' efforts? No. In an interview with New Renaissance Magazine, the real Patch Adams responded to this question by saying the following, "After the movie, there wasn't a single positive article about our work or me. There were dumb, stupid, meaningless things... it made my children cry. They actually thought that they didn't know the person they were reading about." Patch admits that he never expected the movie to be a catalyst that would help spread his idea of care to the masses. "I knew the movie would do this," Adams said. "I would become a funny doctor. Imagine how shallow that is relative to who I am." Patch had dreamed that the film might help him to raise enough money to build a 40-bed hospital on 310 acres of land in Pocohontas County, West Virginia. In the least, he had hoped that the release of the movie would have raised some awareness to what he is doing, which includes being on the road 300 days out of the year, giving as many as eleven lectures a day and visiting the sick all over the world, in countries such as Russia, Bosnia, Cuba, and Afghanistan. Did allowing the movie to be made help Patch's cause at all? The real Patch Adams didn't receive much money for the rights to his story. Universal Pictures did however give Patch's Gesundheit Institute a grant to establish a fundraising infrastructure. This included the services of a professional fundraiser for a period of time. Was Patch happy with Robin Williams' performance in the movie? In a CNN interview, Patch said the following, "I think Robin himself is compassion, generosity and funny. I like to think that that's who I am, and so I think he was the only actor I wanted to play me, and I think he did a fabulous job, and my friends around the country are feeling that he gives that basic message." 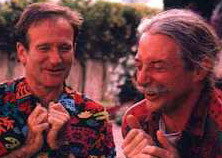 Pictured at left is Robin Williams laughing with the real-life Hunter 'Patch' Adams. Is Patch's girlfriend in the movie based on a real person? No. In the movie, Patch's girlfriend is a fellow med student by the name of Corinne Fisher (Monica Potter). Corinne, who dies at the end of the film, is only very loosely based on Patch's real life wife Lynda, who Patch did meet at medical school like in the movie. As the real Patch Adams explained in an interview, certain aspects of his real life romance with his wife Lynda were injected into the film. This includes the room-full-of-balloons scene. "I filled my apartment with balloons from floor to ceiling. With twenty or so people in the room, no one could see anybody else, but whenever one person moved, everybody could feel it. It was a circus of sensations. She went back to the dorm and told her friends; "I just had the strangest date of my life. I think I'm going to marry this guy." Lynda and Patch were married in 1972 and have two sons. Why did Hunter 'Patch' Adams decide to go by the name Patch? "Oh, Hunter is a Southern-boy name, and during the civil rights movement I was interested in abandoning all the parts of my Southern heritage," Patch said during an interview with CNN. He opted for the name Patch after his stay at a mental hospital. At the hospital, one of the patients who he became friends with dubbed him 'Patch', because his friendship had patched up the loneliness in the patient's life. Did the real Patch Adams really contemplate suicide like in the film? Yes. 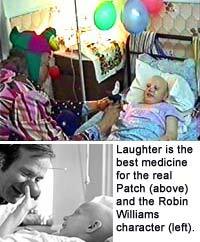 Like Robin Williams' character in the film, the real Patch Adams did in fact contemplate suicide. After Patch's father passed away of a heart attack when they were stationed in Germany, Patch's family moved back home and had to adjust to civilian life in suburban northern Virginia. For a short time, they stayed with his aunt and uncle. His uncle was a lawyer and an independent thinker, who quickly became Patch's surrogate father. Even after he, his mother, and his brother moved into their own house, Patch still spent a lot of time talking to his uncle. "I obsessed about suicide every day but needed to work up to it, so I went to a cliff near the college called Lover's Leap and sat at the edge, writing epic poetry to Donna. I composed sonnets, searching for the right words that would really get to her. If I had ever finished my outpourings I would have jumped. Fortunately, I was too long-winded. After a disastrous visit with Donna, I took a Greyhound bus home and trudged six miles through snow to my mother's doorstep. When she opened the door I told her that I'd been trying to kill myself so she'd better check me into a mental hospital." Did Patch really decide he wanted to be a doctor during his stay at a mental hospital? Yes. After considering suicide, Patch Adams advised his mother to check him into a psychiatric facility. It was there that he realized that many of the patients around him suffered from extreme lonliness. They didn't have people in their lives who loved them as did he. He made friends with the patients, and he soon discovered that the key to human happiness is having loving and caring people in your life. It was then that he decided that the best way to spread his newfound knowledge was by becoming a doctor. Patch became "a student of life, of happy life. I wanted to know everything possible about people and happiness and friendship," Patch says. He had been a student of science since he was a boy, and he always had a desire to be a doctor. His temporary stay at the mental hospital provided him with the right motivation to become one. How old was the real Patch Adams when he ended up in a mental hospital? The film depicts a mid-life Patch (Robin Williams) staying at a mental hospital. In reality, Patch Adams endured three different mental hospitalizations when he was much younger, during the time when he was 17 and 18-years-old. How did the real Patch Adams learn to interact with strangers? Making someone who is sick smile is not always an easy thing to do. During an interview with Spirit in the Smokies Magazine, Patch discussed how he taught himself to relate to other human beings, "I experimented with friendliness by calling hundreds of wrong numbers, pretending to be a sociology student, or anything that would help me draw people out. Out in public I engaged strangers in conversation as much as possible. For example, I rode elevators to see how many floors it would take to get the occupants introduced to one another, and even singing songs." Knowing how to make friends was never a secret to Patch. When he was a boy his father was in the army and his family moved around a lot. They lived in places like Germany, Japan, Texas, and Oklahoma. He learned to make friends at new schools and in different cultures. Does the real Patch Adams have any children? Yes. Patch and his wife Lynda have two sons, Lars and Zag. What is Patch Adams' Gesundheit Institute? Gesundheit is the German word for health. Germans and Americans say gesundheit when someone sneezes to wish them good health. The vision of Dr. Hunter 'Patch' Adams, the Gesundheit Institue is a health community spread out over 310 acres of land in Pocahontas County, West Virginia. For years there have been plans to build a 40-bed hospital on the grounds, but funding has yet to come through. If built, the hospital/healing community would practice holistic medicine, which is an approach to medical care that focuses on the human body's ability to heal itself without the use of prescription drugs and similar over-the-counter medications. Holistic medicine encompasses acupuncture, biofeedback, faith healing, folk medicine, meditation, megavitamin therapy, yoga and other natural healing methods. What is Patch Adams' Vision of a perfect world? With families and other volunteers living on the grounds of the Gesundheit Institute, it seems to be Patch's own island community isolated from the rest of society. If so, what is the real Patch Adams' vision for this community? When interviewed on the Art Bell show, Patch said the following about his idea for a society based on compassion and generosity, "there would be integration of all people. See, right now, in the current system of profit, care has been relegated to the burden category: the burden of our elderly, the burden of our poor, the burden of our mentally ill, the burden of the criminal element—and these are all burdens—where it's really the multinational corporations that are getting the gigantic cuts in subsidies and benefits but we never hear about them being our burden. And so though we ...in the world that I'm working for we wouldn't need mental hospitals; we would have ...one, people would not be working all the time just to make money to consume more; they would ...the work would be connected to the integration of their community." Watch the video clips below to see and hear the real Patch Adams as he talks about his life and his stay at a mental institution during his latter teenage years. Also, watch a clip of Patch performing as a clown. Below is the real Patch Adams' prescription for society; everyday actions you can take to make your community a better and happier place to live. The list came from the Gesundheit! Institute website at PatchAdams.org. *Note: ChasingtheFrog is in no way affiliated with the Gesundheit! Institute nor do we endorse any of the ideas below. Pick up all the trash in an area in your hometown; be its guardian. Tell others about it. Be friendly to everyone at all times; experiment outrageously. Offer a shoulder or foot rub in any environment. Always speak up for justice, no matter how much it costs. Go once a week on a "house call" to a nursing home to cheer people up as a friend. Turn off your TV and become interesting. Perform yourself. Consider being silly in public. Sing out loud. Wear funny stuff. Find ways to need a whole lot less money; share beyond belief. Have potlucks frequently, with neighbors, co-workers, strangers. Work toward living in extended families. Take your vacations in your own hometown and spend the money working on projects there that help build community. Gesundheit! by Patch Adams M.D. House Calls by Patch Adams, M.D.